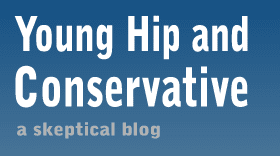 Young, Hip and Conservative: a skeptical blog: Just how greedy are health insurance companies? Just how greedy are health insurance companies? I was talking to a friend about what's wrong with the America health insurance system after she presented a link to what I see as a ridiculous presentation about the greed of an insurance company. In a sea of numbers, the article and accompanying video lamented that Wellpoint was suing the state of Maine to raise premiums b 18.5 percent. This number was stressed over and over, and for good reason - it's a scary number, that's almost a one-fifth increase. But further down, after a lot of hot air about greed and rich CEO's, the important number came out; Wellpoint wants to keep a profit margin of 3 percent. A mere 3 percent? That's a pathetic amount of money! The Maine Superintendent of Insurance even ruled 3 percent was "excessive and unfairly discriminatory." But 3 percent is peanuts. It's not even one-fourth of what non-profit groups embezzle. Sure, the money adds up if you look at the total revenue generated, but the company has a lot invested - all of which is very much at risk to the whims of the market. The entire greed-based explanation for our health care problems is ridiculous if you try to take it seriously. That is, insurance companies knew they could always charge more, but decided to wait until now to rake in the money. Isn't it odd that they waited until the focus of the entire world was on them, and still decided to ratchet it up? Even with the government threatening to change the rules and cut their profits for this very reason? And if its such an easy way to make money, why are so many insurance companies leaving the marketplace? One reason this view is so popular is that it's an emotionally satisfying explanation. Instead of a complicated list of what's wrong with our health care system, it's much easier to say that the bad people are hurting everyone and we can fix it by having the government take over. I like how the linked article talks about Monoplies. If the government took over it would most likely monopolize the industry. Compromise is the way to get things done in a democracy. What if liberals & conservatives each gave and took a little? Such as, allowing interstate insurance competition, health savings accounts, and only requiring people to have catastrophic insurance – but requiring insurance companies to provide policies regardless of pre-existing conditions, and government subsidies for low-income people. If that happened, we'd live in a much better world.